The Ohio State University Radio Observatory (also known as the Big Ear Radio Observatory) became well known for its unique radio telescope (the "Big Ear") and the discoveries made with that instrument. (3) Ohio Historical Center, in Columbus, Ohio. From the "DISPLAYS MENU" below, you may link to a section of this website describing the "Big Ear" display at each of the above facilities. 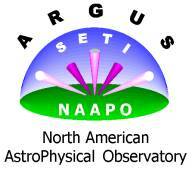 Copyright © 2003-2004 Ohio State University Radio Observatory and North American AstroPhysical Observatory. Last modified: August 10, 2004.